At the Heel and Arch Pain Clinic we employ the latest in foot pressure and gait analysis technology, enabling us to obtain a precise image of the foot from which a computer generated cast then orthotic is made for each individual. The orthotics prescribed and designed by the Podiatrists at the Heel and Arch pain Clinic are made to align the foot in its correct foot posture. This will reduce excessive force on the heel and arch, and as a result heal the injured and damaged tissue. We can prescribe different styles of orthotic/innersoles to fit into a range of shoes from joggers to dress and court shoes. The orthotics prescribed and designed at the Heel and Arch Pain Clinic are made to align the foot in its correct foot posture. 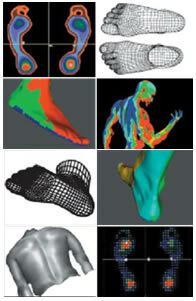 In time, your foot will conform to the shape of the orthotic. The muscles and ligaments are realigned, thus eliminating stress, repetitive trauma and related discomfort. Most of our orthotics flex as you walk, thus exercising the muscles in the feet and absorbing shock from hard walking surfaces. Often one of our podiatrists will apply taping and padding to the foot on the first visit. This will help decrease the pain before being issued with the orthotics.